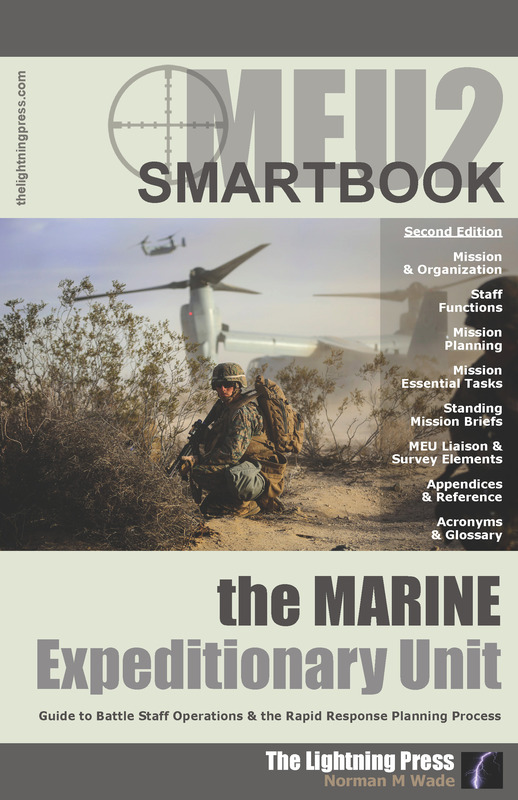 The Marine Expeditionary Unit (MEU) SMARTbook is designed to be a reference for MEU and PHIBRON Commanders, MEU and PHIBRON staffs and the commanders and staffs of the Major Subordinate Elements (MSE) and Naval Support Elements (NSE) of the ARG-MEU team. Topics include: MEU mission, organization, and capabilities; MEU staff functions; mission planning (R2P2 & MCPP); mission essential tasks; standing mission briefs; MEU liaison and survey elements; appendices and reference guides; abbreviations, acronyms and glossary. The Marine Corps Planning Process (MCPP) is the basis for MEU staff planning. Planning is the art and science of envisioning a desired future and laying out effective ways of bringing it about. In war, planning can be essential to the ability to seize the initiative. In order to seize the initiative, we must be able to anticipate events and act purposefully and effectively before the enemy can. Planning mitigates crises by dealing with crisis situations before they reach crisis proportions. The Rapid Response Planning Process (R2P2) is an accelerated execution of MCPP geared to Crisis Action Planning. The R2P2 process allows the MEU/PHIBRON to anticipate potential missions, create a set of standardized responses through analytical decision-making, and rehearse their responses to achieve full capability within six hours of receipt of a warning or execute order. Rapid planning requires extensive training in the techniques and procedures associated with R2P2. It requires standardized, detailed, parallel, and concurrent command and staff actions using Standard Operating Procedures (SOPs) that are understood by all members of the unit. 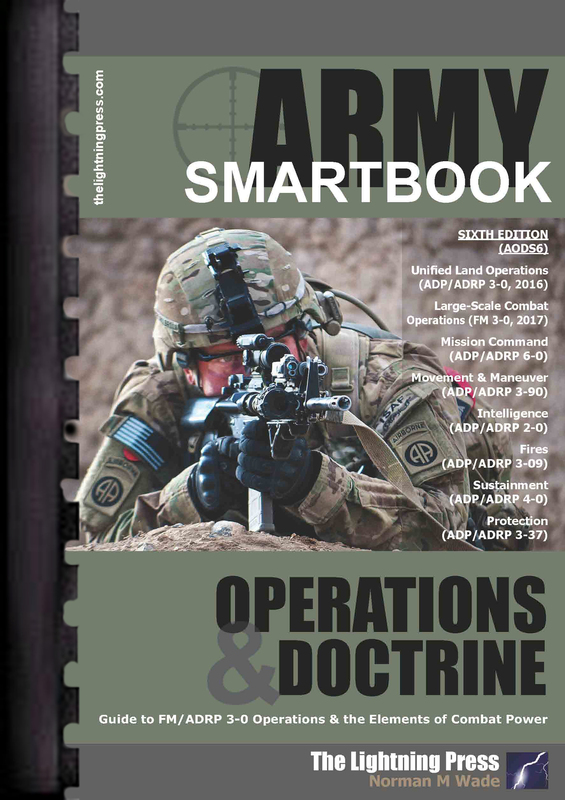 The Marine Expeditionary Unit (MEU) SMARTbook helps to generate tempo and staff synergy in time-compressed situations through the use of “playbooks” for rapid planning and templates for efficient briefings. MEU2 is the 2nd printing of the MEU SMARTbook (1st printing ISBN 978-1-935886-18-1), featuring doctrinal updates to the text, a full cross-referenced index in place of the previous chapter 8, and our new updated perfect binding with spine in place of the previous plastic-comb binding. 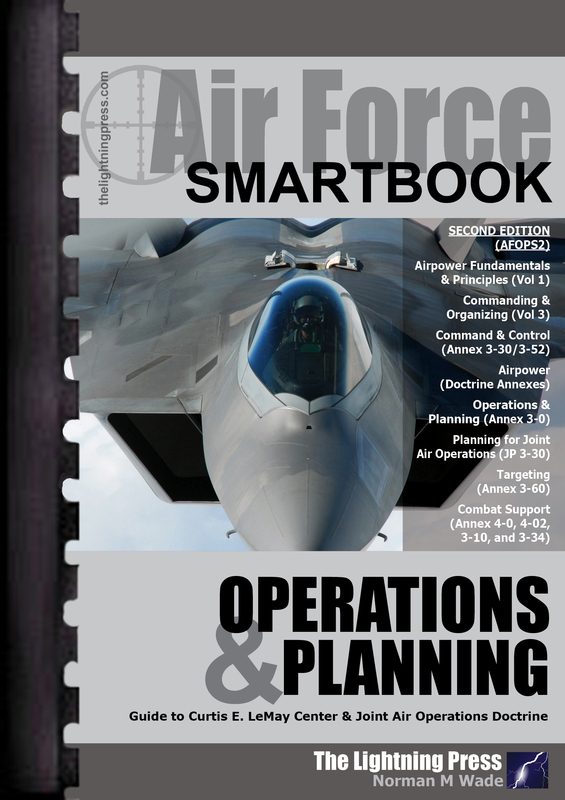 Chapters and topics include MEU Staff Functions, Mission Planning, Mission Essential Tasks, Standing Missions, MEU Liaison and Survey Elements, Appendices & Reference, and Abbreviations & Acronyms. 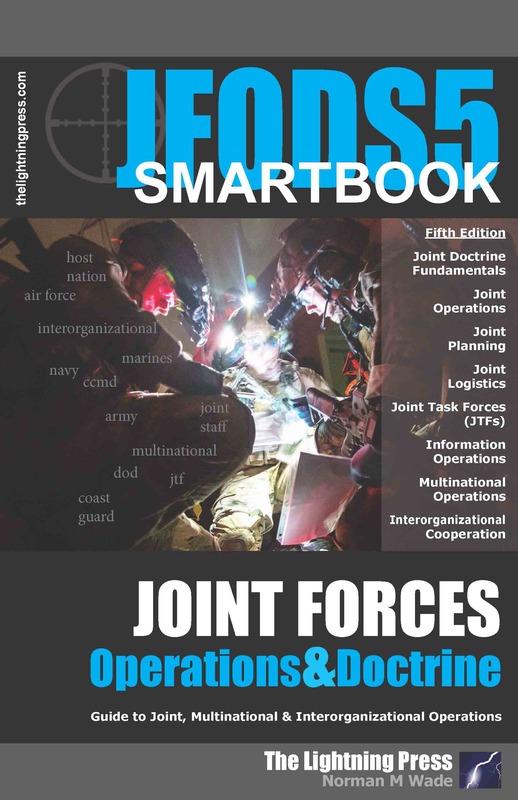 Providing an outline of Navy operational-level fundamentals and concepts, command, control, and organization, The Naval Operations & Planning SMARTbook covers essential Navy keystone warfighting doctrine and maritime operations at the JFMCC/CFMCC, Fleet and JTF levels. It bridges between the theory of operational art and the practical specific guidance that Navy commanders and staffs require to accomplish their mission. 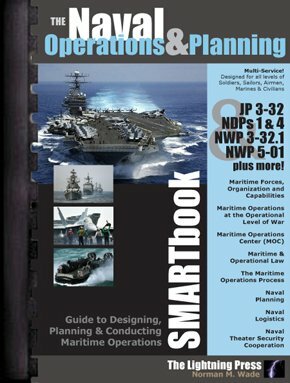 Chapters and topics include maritime forces, organization and capabilities; maritime operations; maritime headquarters (MHQ) and the maritime operations center (MOC); the maritime operations process; naval planning; naval logistics; and naval theater security cooperation! Unlike the other components of the joint force, the maritime component routinely conducts operations across all of the domains, described as air, land, maritime, space, and the information environment. The maritime domain is defined as “the oceans, seas, bays, estuaries, islands, coastal areas, and the airspace above these, including the littorals.” This joint definition has fundamental implications for the Navy’s role in joint operations. The Navy is the principal warfighting organization that conducts operations over, on, under, and adjacent to the seas: overlying airspaces, surfaces, sub-surfaces, and the ocean bottom, as well as the shoreline infrastructures that affect maritime operations. The maritime domain also contains social, economic, political, military, and legal components. About 70 percent of the world’s surface is covered by the oceans and seas. Naval forces operate from the deep waters of the open ocean to the generally shallower waters fronting the coastlines of the continental land mass and large offshore islands. About 50,000 large ships carry approximately 80 percent of the world’s trade. Each year 1.9 billion tons of petroleum, or some 60 percent of all oil produced, are shipped by sea. Some 75 percent of the world’s maritime trade and 50 percent of its daily oil consumption pass through a handful of international straits. There are some 4,000 ports involved in maritime trade, including 30 so-called mega-ports. Navy forces demonstrate the nation’s resolve and intentions from international waters. Forward-deployed Navy forces are often times the nation’s first responders to events requiring military response outside the homeland. When adversarial action occurs beyond our borders, as a key element of the joint force that is readily capable of employing credible combat power forward, Navy forces are often times the first on-scene force to exercise the deterrence phase of a joint operation or campaign. In contrast to the war on land, sea control is not obtained by occupying or capturing a certain ocean or sea area. It is not obtained through the permanent presence of one’s fleet. There are no front lines at sea and no fortified positions by which one can control the territory. The sea or ocean area is invariably abandoned by the victorious side regardless of whether the opponent was completely defeated or not. Sea control means that more or less by the destruction of the enemy fleet one can accomplish tasks without serious opposition from the enemy.